Possessing distinctive qualities that produce unaccountable or baffling effects. The California Health Care Foundation does some really good work. I listened to their President Mark Smith give a speech at the Microsoft conference last June and came away really impressed with him and what the organization is all about. They also generate quite a few solid reports on issues affecting Californians but also as representative of what the rest of the nation can look forward to as well. 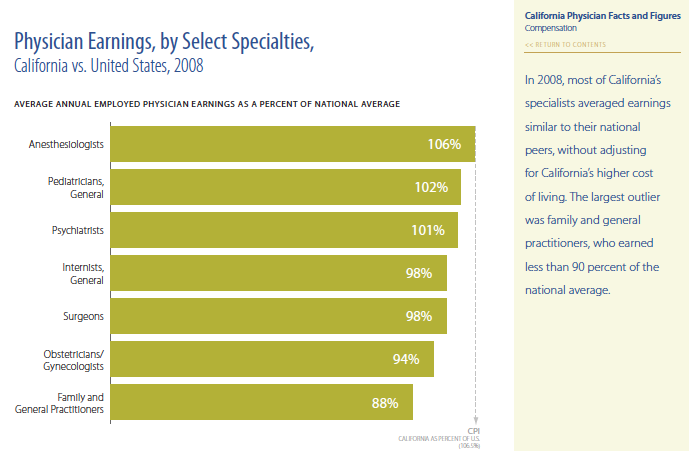 An interesting report that was recently issued related to the supply of California physicians. The report is basically a powerpoint, which is really smart, because in our world of information overload a powerpoint is about all the detail you can swallow on a quick scan through. Four of the slides really caught my attention as they told a compelling story of what has happened to primary care. We begin our review by noting that general physician supply has been flat for the last 15 years. There are a variety of reasons for this including economic alternatives, fixed number of medical schools, and the length of training versus the end payoff during the career. 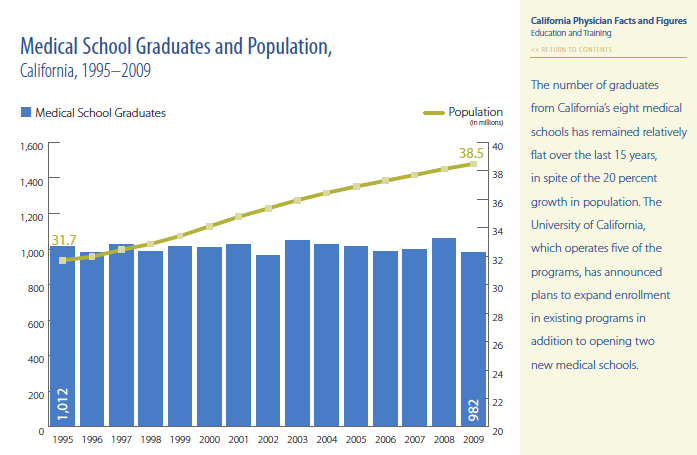 Medical Graduates has remained flat in the CA for last 15 years while population has grown 40% during that time. The flat physician supply is bad enough, but coupled with more than a decade of medical school graduates choosing specialties (less than 10% remain in primary care), we see a growing disparity in the numbers going into these safety net fields. The multifactorial reasons why graduates don’t pursue care in primary medicine relates to revenue model, business model, intensity of work, and job satisfaction among others. 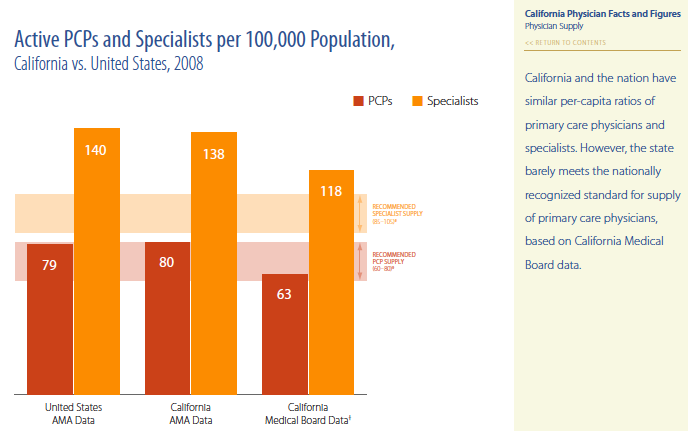 California barely meets the nationally recognized standard for numbers of primary care physicians. This is demonstrated in the attached slide showing the payment disparities between specialties. While primary care has enjoyed a recent increase it salary it has only moved from a running joke to a one liner. the 20% increase still puts it dead last in compensation and ~$15K lower than the next closest specialty. 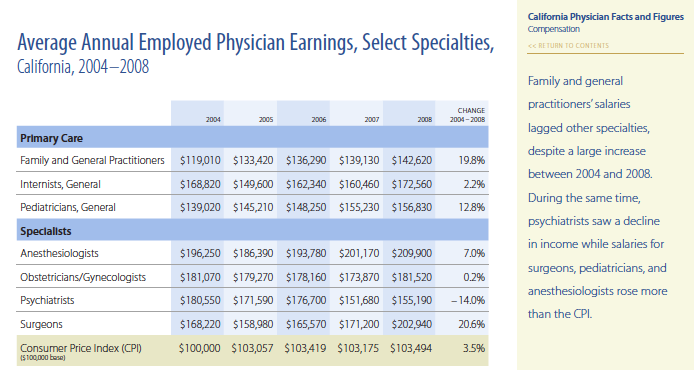 While primary care has enjoyed a 20% increase, it is still $15K lower than the next lowest paid specialty. To add insult to injury, California Primary Care Physicians are not just economically under appreciated as a specialty, they are also under appreciated geographically when compared to their peers. In one of the most expensive places in the country, they only make about 88% of what their peers make in other states. When comparing CA PCP's against their peers in other states, they earned about 90% of national average. Putting this all together paints a pretty tough picture for primary care – flat physician supply, only 5-8% of grads going in primary care, as a result of low pay, and for those choosing to stay in California they are rewarded with even less relative pay comparing to their PCP peers in other states. These are all big macroeconomic trends that will take a long time to correct. However, in the short run, at Crossover Health we believe that we give PCP’s HOPE that there is a better way, HOPE that there is a brighter day, and HOPE that they can either once again return to the medicine they loved to practice or forge ahead in creating an entirely new type of health care based on membership business model, using a powerful technology platform, and creating a new value network of specialist and ancillary providers. We believe we can raise the bar through each of these innovation singly, but when synergistically applied, we think we have something magic.